Practitioners and judges from Jacksonville and the surrounding areas gathered at the Bryan Simpson U.S. Courthouse on April 20, 2017, for the fourteenth installment of the Honorable Ralph W. “Buddy” Nimmons, Jr. Federal Practice Seminar. Throughout the afternoon, attendees heard about cutting-edge issues of interest to federal practitioners from several guest speakers. On February 23, 2017, over 180 people gathered at the Old St. Andrews Church for this event commemorating Black History Month. 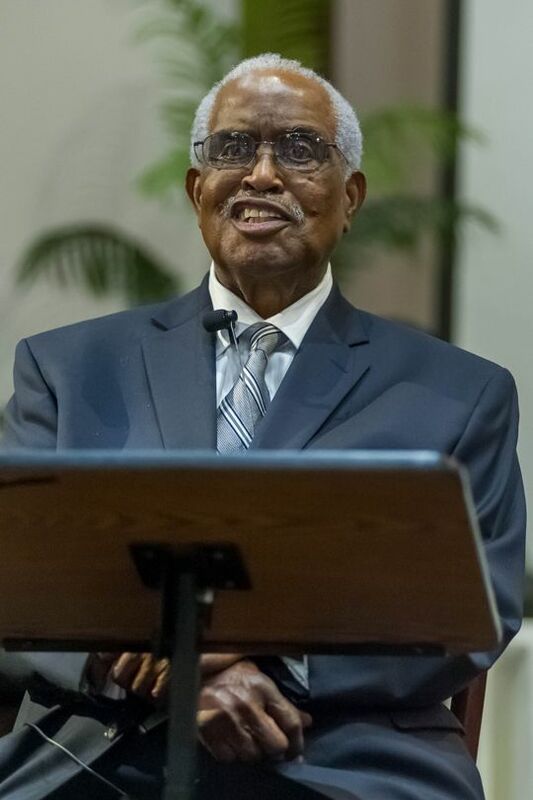 The event was hosted by The Jacksonville Historical Society, the Jacksonville Chapter of the Federal Bar Association, and the D.W. Perkins Bar Association. Sponsorship was provided by the Middle District of Florida’s Bench Bar Fund. Speakers included Mr. Thomas Jackson, a lifelong St. Augustine resident who witnessed the memorable events of that summer as a teenager, and the Honorable Joseph W. Hatchett, former Chief Judge of the United States Court of Appeals for the Eleventh Circuit and a former Florida Supreme Court Justice. Judge Hatchett was a Cooperating Attorney with the NAACP Legal Defense Fund from 1960-1966, and he shared vivid recollections of the period. A video of the event will be posted shortly. For additional information about the program, please click on the title, above. On February 2, 2017, nearly 150 judges and lawyers from the Jacksonville legal community gathered in the U.S. Courthouse to hear a riveting presentation from legal historian and practicing criminal defense attorney Douglas Morris. Providing important lessons for lawyers to guard against any threat to a fair and just legal system and an independent judiciary, Mr. Morris’ presentation described how the Nazis disabled Germany’s legal system and constitutional framework as an early step toward establishing totalitarian rule. Special thanks to the lawyers of the Middle District of Florida who sponsored this program through the Court’s Bench Bar Fund and to the Honorable Harvey E. Schlesinger, United States District Judge, who worked with the American Bar Association and the German Federal Bar Association to bring this important program to us and to bring a related traveling exhibit to the Jacksonville Public Library. A copy of Mr. Morris’ book chapter on the same subject is available here. On December 15, 2016, judges, lawyers, courthouse staff, local students, and members of the community gathered in the lobby of the Bryan Simpson U.S. Courthouse in Jacksonville, Florida, to celebrate the 225th anniversary of the ratification of the Bill of Rights and the unveiling of a new, permanent display of a recently rediscovered Bill of Rights plaque from the old courthouse. To add to the festivities, students from Jacksonville Beach Elementary School sang patriotic songs and James Madison himself gave a reading of the Bill of Rights. Three local middle-school students received awards for their submissions to a contest sponsored by the Bench Bar Fund. The celebration culminated with remarks from Judge Corrigan on the rediscovery of the historic plaque and a dramatic unveiling of the new display. The display can be viewed in the courthouse lobby, and the winning contest submissions can be viewed through January 31, 2017, in the clerk’s office. Our Tenth Annual Spirit of Giving luncheon was held on December 9, 2016, at The River Club. Whitney Untiedt was an inspiring speaker who reminded us of the challenges facing children in the criminal justice system. And special congratulations to our award recipients – Jennifer Mansfield for the civil practitioner award, Mac Heavener for the criminal practitioner award, and a special award this year to Judge Howard for her continued commitment to outreach and public service. The Jacksonville Financial News & Daily Record article about the luncheon is available online here. On April 21, 2016, our Chapter held the Thirteenth Annual Hon. Ralph W. “Buddy” Nimmons, Jr. Federal Practice Seminar. This special event was held on March 2, 2016 to honor the legacy of the late U.S. District Judge Howell Melton, who passed away in December 2015. U.S. Magistrate Judge James Klindt, one of Judge Melton’s former law clerks, presided over the event, which featured presentations about four of Judge Melton’s most significant cases—United States v. Carlos Lehder, Robinson v. Jacksonville Shipyards, United States v. Gaffney, and Parker v. Dugger—from lawyers involved in each case. The Jacksonville Financial News & Daily Record article about the luncheon is available online here. We held our annual Spirit of Giving Luncheon on December 11, 2015, at the River Club. Our featured speaker was former First District Court of Appeal Judge William Van Nortwick, member of the Florida Commission on Access to Civil Justice. In addition to Judge Van Nortwick’s remarks, the Court presented Spirit of Giving awards to lawyers who have gone above and beyond in providing service to those in need. The Jacksonville Financial News & Daily Record article about the luncheon is available online here. 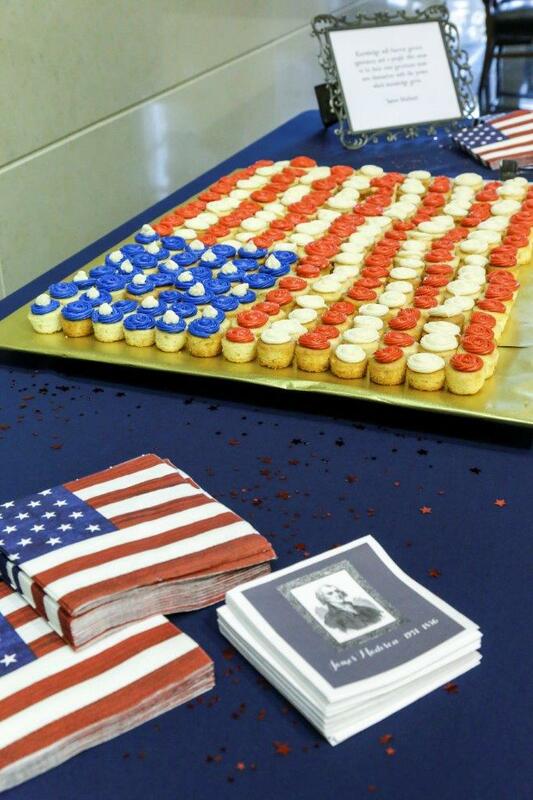 On September 17, 2015, the Jacksonville Chapter of the Federal Bar Association hosted our annual Constitution Day event. This year our CLE program was “Madison’s Avenue: The Rough Road to the Bill of Rights” presented by the Honorable Timothy J. Corrigan, United States District Judge. Over 130 members and guests enjoyed the educational and entertaining program, getting a behind the scenes look at James Madison\’s significant contributions to the creation of the Bill of Rights. At the end of the program, we were treated to special surprise as Judge Corrigan unveiled a long lost bronze plaque of the Bill of Rights from the old courthouse. The plaque will soon be proudly displayed in the current courthouse. The Jacksonville Financial News & Daily Record article about the luncheon is available online here. 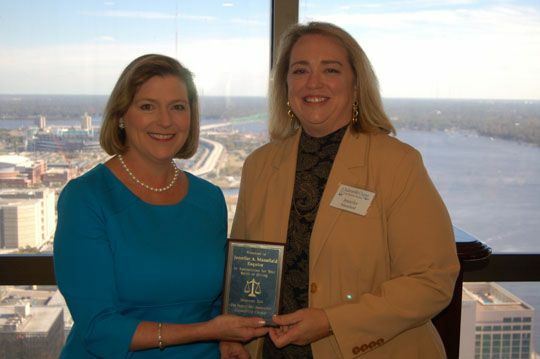 On August 20, 2015, the Jacksonville Chapter of the Federal Bar Association hosted a special luncheon at the Jacksonville Courthouse to honor Judge Schlesinger on the occasion of his fortieth anniversary on the federal bench. Judge Schlesinger’s wife along with his three daughters, their husbands, three of his grandchildren, and many of his former law clerks from near and far joined the local bench and bar in celebrating Judge Schlesinger’s many contributions to the court, the community, and the lives of those privileged to work with him. 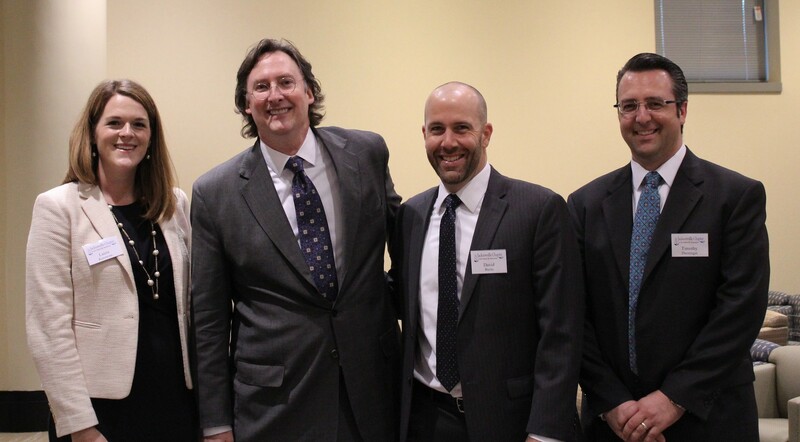 His colleagues and former clerks shared stories, both touching and humorous, and a great time was had by all.